Happy Sunday friends!!! Another weekend come and gone………..it’s OK with me since, one, I’m dying for some warmer weather and two because I’m counting the weeks until we get to meet my baby boy!! Now this weeks theme is right up my alley! Anyone who knows me must know by now that me and my slow cooker (aka. Crock-It) have a serious love affair going on! All Winter long I put it to good use, during the summer I use it to avoid using the oven, it’s a win win for this Momma! Well this weeks #SundaySupper theme is more than just slow cooker recipes! It’s any recipe that cooked Low or Slow!! A big thank you to Susan over at The Girl in the Little Red Kitchen for hosting this fabulous event. OK so what did I decide to share with you today? Well I’ve been making this dish for a long time, it’s by go to old time favorite that I used to make in a casserole dish in my oven. Well I decided to try it in the crock pot this time and boy was I NOT disappointed! I even ventured out their and used chicken thighs instead of my usual chicken breasts. I also added some fresh cilantro (my new fav!) after it cooked and the dish! It’s simple and delish! I often serve it with plain brown rice and use the tomatoes to mix it with so it adds flavor to the rice! Pour the diced tomatoes and salsa into a crock pot. Place chicken thighs on top, pushing the chicken into the sauce. Place chicken on a serving dish, pour mixture on top and sprinkle fresh parsley on top. Now onto what the others have shared with us! Save them, jot them down, pin them……….whatever you need to remember your favorite new dish to make! Great recipe! I can see shredding the chicken and using it in tacos and more. Great dish, and very fun and festive too! I agree with Renee, I bet it’d be great in tacos. 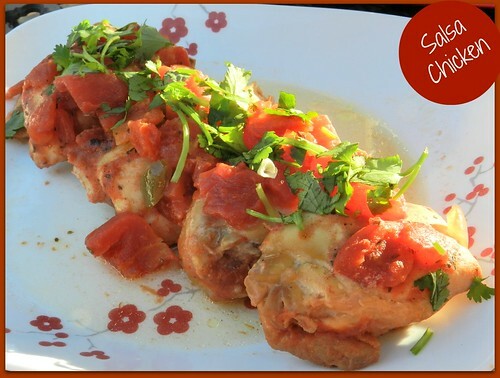 We make salsa chicken all of the time! I love shredding it up for tacos! I love salsa and chicken together! Beautiful recipe!! Quick prep and no fuss cooking! Sounds good to me! Easy to make with only a few ingredient = a winning weeknight meal for me! Thanks for sharing. Simple recipes these get lost, but it is often recipes with so few recipes that taste so good and can be so easy to make. Plus cilantro is a great variation. Love how easy this is and it looks delicious!! I bet this is so tender and delicious – and so simple to make, great recipe! Can this be any easier? It´s a great filling for enchiladas Tammi! My kinda recipe…Easy…and I bet it tastes great too! Thanks for sharing..definitely pinning! Ooh, nice and easy ! Love those kind of meals for a quick weeknight supper. Lovely Tammi ! Such a quick and easy dish! Sounds like the perfect dish for supper! I love simple, easy meals for weekday supper. This looks so good! And the leftovers would be perfect for tacos the next day. I love the simplicity of this – and yet I can see it’s bursting with flavor. I agree with Isabel – the leftovers really would be perfect for tacos. Or a quesadilla. Yum, so simple and delicious! Love the hit of fresh cilantro!